Tomorrow, 20th March there may be the opportunity to view a solar eclipse. In Leicester this is predicted to be from approximately 8.30a.m. to 10.30a.m. and will depend somewhat upon weather conditions. Please note: school will be open as normal and all children will be expected to attend on time. In the interests of safety, please make sure that your child understands NOT to look directly at the sun during this or any other period. Please see below for a cheap and effective viewing method. 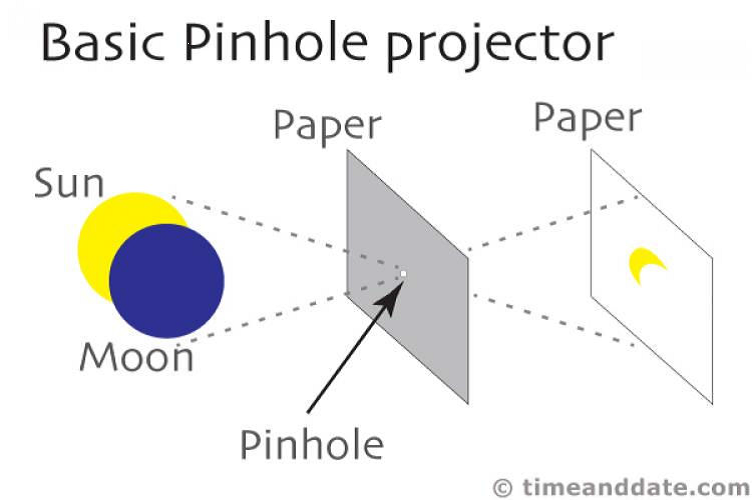 A pinhole projector projects an image of the eclipse on to a sheet of paper or a wall.  Two sheets of plain white paper - the kinds you use for printing are perfect.  Or, two pieces of stiff white paper or white cardboard.  A thumbtack or a sharp pin. in the middle of it using a pin or a thumbtack. Make sure that the hole is round and smooth. 2. Hold this piece of paper in front of the Sun. Remember, do not look at the Sun directly! Sun is projected on it through the pinhole. 4. To make the image of the Sun larger, move the screen away from the pinholed sheet.